In her first congressional appearance as chairman, she sounded keen to see inflation rise toward her predecessor’s 2 pct target. But as well as full employment, the U.S. central bank is supposed to seek “stable” prices. 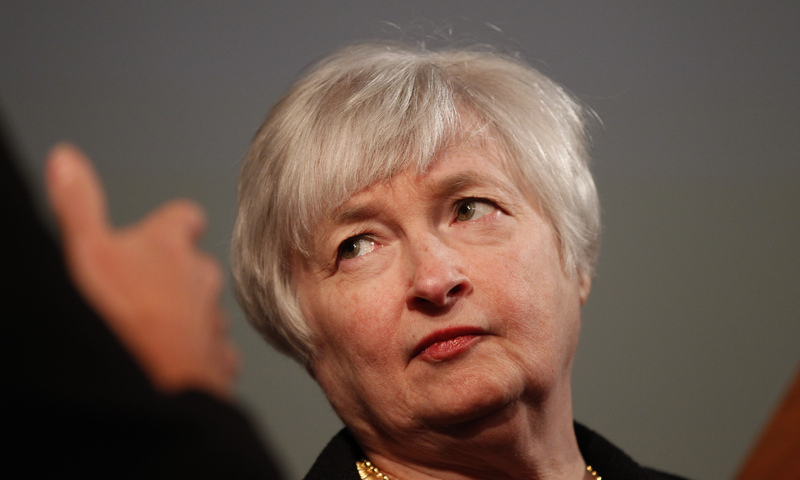 Yellen’s interpretation highlights a big Fed vulnerability. Janet Yellen, vice chair of the Board of Governors of the U.S. Federal Reserve System, is shown prior to addressing the University of California Berkeley Haas School of Business in Berkeley, California November 13, 2012. Federal Reserve Chair Janet Yellen, in her first semiannual testimony to Congress under the 1978 Humphrey-Hawkins Act, reiterated several times that inflation was below the Fed’s 2 percent target and that the current policy objective was to push it toward that target. In response to questioning Yellen also stated that she saw an excess of saving, and that U.S. savers could not expect higher returns from risk-free instruments until economic conditions had normalized. According to the Bureau of Economic Analysis’ advance estimate of fourth-quarter GDP, released on Jan. 30, the U.S. personal savings rate in that quarter was 4.3 percent.